Family Weekly News story by Jack Ryan, dated September 26, 1965. David McCallum's eyes shift furtively beneath his shock of blond hair as if the letter he holds in his hand contains a world-devastating secret. "We are the girls who chased you into a gas station here," the fans write. "When we cornered you, you said, 'How old are you, anyway?' David, what did you mean by that?" 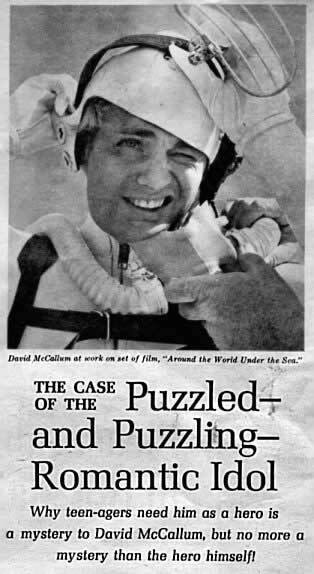 McCallum is bewildered. "Don't they understand that I was telling them how silly they were to make such a fuss? Why must youth have idols? I never needed idols. Their families must not be giving them something they need." The needs of modern youth is only one of many dilemmas explored by the curious mind of actor David McCallum. A wispy, 5-foot-8, 31-year-old nonhero, he unexpectedly finds himself the darling of youth. And, like the youth that worships him, he is an enigma. "I might describe myself as . . . ah, diffident," David says - and then breaks off to run to his dictionary, which is never far away. He looks up words, not because of any lack in his vocabulary, but because he must be precise in everything he does. "No, diffident means shy. I'm not shy." More research. "Ah, here it is - aloof. No, this word is better - detached. I am detached." Detached he is in many respects. Extremely popular with fellow workers, he is invited to a party by Keenan Wynn, his costar in the science-fiction thriller, "Around the World Under the Sea." He replies: "Sorry, can't make it." He is urged to join a yachting party by actress Shirley Eaton and her husband. "Sorry . . ." Instead he locks himself in a room and pounds a typewriter or drives to a newly purchased home in the protective Hollywood Hills and tends his rose garden in solitude. Maybe he is more "diffident" than he admits. The Scottish-born actor doesn't need to look up the word "frugal." He knows it applies to him. He boasts, for example of the expensive camera he bought from a magazine as a bargain, then concedes he takes few pictures. "I wouldn't want to spend much money on film unless I could sell the pictures." Frugality even applies to his time. He clocks the minutes it takes to drive to work. "Down the expressway, I make it in 22 minutes. Let's see, this new route took 20. We saved two minutes!" But, of the many McCallum characteristics, conscientiousness comes through strongest. Andrew Marton, director of "Around the World Under the Sea," mumbles after a scene: "A pro that David is." And conscientiousness applies not only to the way he works, but even to the way he strives to be a better husband and father. On location, David receives a letter each day from his actress-wife Jill Ireland ("I've got white blinds up in the living room now . . . I'm moving my paintings around . . . I've lost confidence in my earlier ones - the color."). He sets everything aside to send off a reply. David is fascinated by the idea of applying the animal-training theories of Ivan Tors, producer of "Around the World Under the Sea," to his three children, Paul, 7, Jason, 3, and Valentine, 2. Tors runs a California animal farm in which the usual punishment-reward method of training animals is supplanted by love and affection. "Petting is very important in Tors' training," David muses. "Ivan uses touch to give his animals a sense of security. Children respond the same way. You can't be subtle in loving a child; you must demonstrate your love in a physical way. Yes, when I return home from location, I've determined to hold my children more often and very close. They should be able to cuddle with their parents and feel the security of physical closeness." You almost get the impression McCallum is reflecting wistfully on some old needs of his own. He is the son of cellist Dorothy McCallum and violinist David McCallum, concertmaster of the Mantovani Orchestra. He began preparing for an artistic career at 14, when his father found backstage jobs for him. "I was made self-reliant very young," he reflects, "but not self-reliant in a competitive way. I was never out playing with other children and taking daily knocks, and I think it left me a little introverted." Despite his own parents' urgings toward music, David was drawn to the theater - but without much initial success. When he was in his twenties, his father told him: "We're through subsidizing you. Only if you study the oboe will we continue to support you." David chose a life which he now describes as a game of "Whom do we pay next?" or "Is this the moment for bankruptcy?" Yet, in 1957, he spotted a magazine cover of Jill Ireland, arranged an introduction, and, though hardly impulsive, married her a week later. The heartthrob of millions recalls: "In those days I was romantic, but I've matured. I no longer have romantic illusions about physical beauty." Then he assures you that his own wife is not only "quite a dish but intelligent." Before leaving for the U.S., David's parents and friends again urged him to abandon acting. "If you haven't made it by your age at home," they said, "you never will." David did make it, however, in the role of Illya Kuryakin in the television series, "The Man from UNCLE." He describes Illya as "a noninvolved person like myself, who has no known life away from his business and who never answers a question directly." Success has done little to change McCallum. He remains boyishly naive in many ways. He has no desire to make a career as a romantic idol; yet the experience is still so new he walks about half-afraid teen mobs will notice him - and half-afraid they won't. The fans are admittedly an enigma to him and he to them. 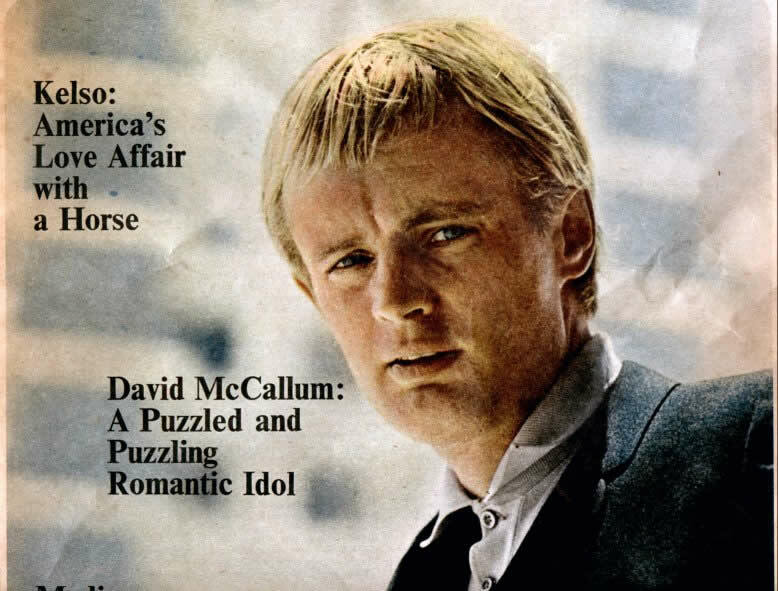 But sometimes when David McCallum rambles on, bemused by human needs, you get the idea that teenager and teen-age idol have more in common than they realize.